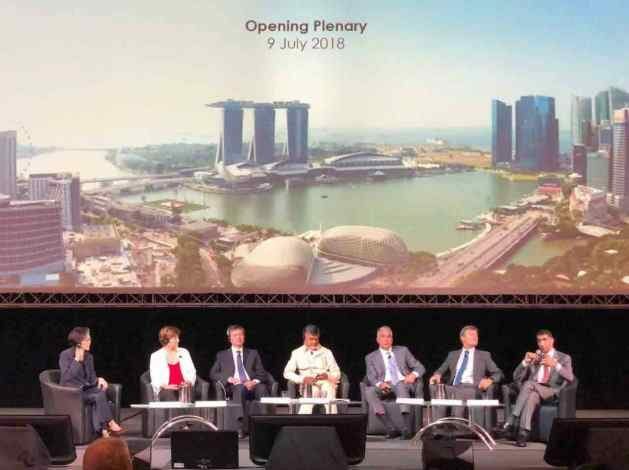 SINGAPORE, Jul 9 2018 - A UAE delegation, led by Dr. Thani bin Ahmed Al-Zeyoudi, Minister of Climate Change and Environment, is participating in the Singapore Urban Sustainability Week. During the event, running from 8th to 11th July, Dr. Al-Zeyoudi is attending multiple meetings with top officials, including Lawrence Wong, Singapore Minister for National Development and Second Minister for Finance in Charge of Food Security, and Patricia Espinosa, Executive Secretary of the United Nations Framework Convention on Climate Change, UNFCCC. The meetings seek to explore new areas of cooperation and coordinate efforts in natural resources conservation and sustainability. In a panel discussion entitled, ‘Innovative Urban Solutions for Liveable and Sustainable Future’, Dr. Al Zeyoudi highlighted the UAE’s successful journey towards sustainability and addressing the impact of climate change, as part of the CleanEnviro Summit Singapore that runs on the sidelines of the Singapore Urban Sustainability Week. To gain firsthand experience of Singapore’s agricultural and environmental practices, the delegates are touring several facilities including ‘The Learning Forest’, a garden that features elevated walkways allowing visitors to explore habitats ranging from a freshwater forest wetland to a lowland rainforest. Visits to the Buildings and Construction Authority Academy – the education and research arm of Singapore’s Building and Construction Authority, Tuas South Incineration Plant – Singapore’s largest waste-to-energy plant, and Panasonic’s vertical farm are also on the agenda. In addition, the UAE delegates are meeting with representatives of private environmental and agricultural businesses, such as Arjen Droog, Vice Director of Food Valley – a region in the Netherlands where international agrifood companies and research institutes are concentrated, and Michael Dean, Co-founder and Chief Investment Officer of AgFunder, the US-based online venture capital platform that invests in agrifood tech companies. Moreover, the delegation is attending a presentation on carbon tax by the Singapore Ministry of the Environment and Water Resources. Singapore Urban Sustainability Week is an umbrella for events including CleanEnviro Summit Singapore, Singapore International Water Week, and World Cities Summit. Aimed at connecting business experts, policy-makers, industry leaders, and innovators through strategic collaborative efforts and cutting-edge technologies, it provides a unique global platform to drive integrated urban solutions.